Ten minutes in on our third dive (out of four) at the Swedish Championship (which is a splash-down competition, much like the World Championship), I noticed my Leak Detector LED was flashing. At first I didn't realise what it was as I had never seen it before, and as I was under lots of stress due to the competition. When I had cleared my mind I understood what it was and started to look for water in the housing. As it is an Ikelite (D800E) it is transparent and I could examine every inch of it. Soon I found drops inside and showed thumps up (which felt a little weird at the time, thumps down would better have suited my feelings) for my buddy. He was at the time positioning my snoot so he pointed it bit higher. No no no, UP UP, thumbs up again. He replied by pointing the strobe even higher, which at the time now was pointing far from the subject which made him a bit confused. I got a little stressed, took the strobe away from him and pointed at my camera, showed him the drops and gave him thumbs up. This time he got it. We were only at 10 meters of water, so we quickly reached the surface. Got picked up by the boat and our diving time was paused (max dive time is one hour per dive). The problem was that I had forgotten to put the block-off plug on the vacuum connector (first time...). Fixed that, dried out the housing, the camera and lens and housing TTL were all OK as I also had a leakinsure sachet that had sucked up 99% of the water (more than just the drops that I saw). Reset the Leak Detector. Put it all together and completed the dive and won the Swedish Champion in Underwater Photo 2015, partly thanks to your Leak Detector ! 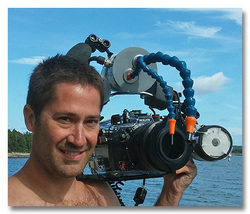 Peter Segerdahl - (Sweden) - Nikon D800E in Ikelite housing - see Peter's work at his Facebook Page.